Wat Ratchanatdaram Worawihan, วัดราชนัดดารามวรวิหาร, a third class royal monastery, was constructed by the order of King Rama III to honor Phra Ong Chaoying Sommanat Watthanawadi who was later elevated by King Rama IV to the rank of Her Royal Highness Queen Sommanat Watthanawadi. Chao Phrya Yommarat and Phraya Mahayotha were the directors of the temple construction, but the former was unluckily killed while he was directing the construction work. 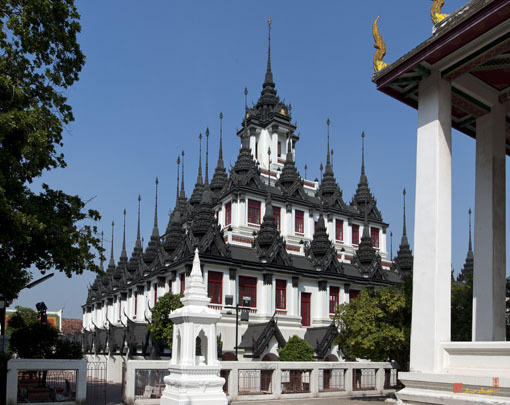 A major feature of the temple is Loha Prasat (Metal Castle), โลหะปราสาท, the Thai-styled sanctuary which was adapted from similar buildings in India and Sri Lanka. Importantly, it is the only such sanctuary left in the world. The three-storey sanctuary has thirty-seven spires representing the thirty-seven Phra Phothi Pakkhi Yatham -- the "Virtues Leading to Enlightenment". The Fine Arts Department has registered the temple as a national monument since 1949 (B.E. 2492).